Notes on Pictures, starting with the top left. 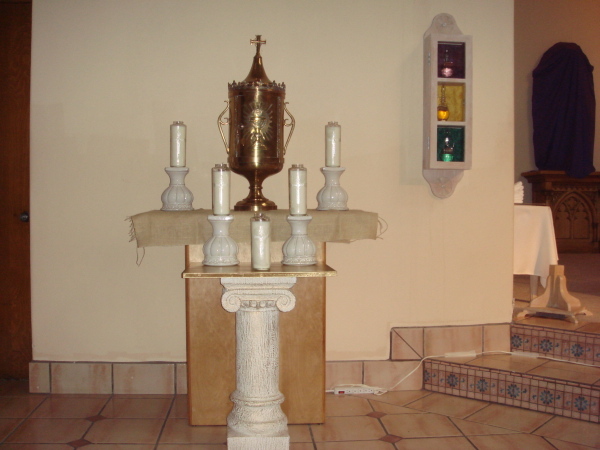 1)The Altar repose for Holy Thursday, 2)Bread given out during Mass of the Lord's Supper, 3)The sanctuary decorated for Holy week, notice the draped statues in the background, 4)The community of St. Genevieve visiting shrines in the neighborhood while praying the stations of the cross, 5)Pilgrims at another neighborhood shrine, 6)Lilies decorating the Church for the Easter Celebration! 7)Our Lady amidst Easter lilies, 8)Looking into the beautiful valley of Las Cruces from the Organ Mountains in the evening.